Davao City Vice Mayor Paolo Duterte slammed the latest witness of the Senate inquiry on extrajudicial killings who implicated him in two summary killings allegedly perpetrated by the shadowy vigilante group Davao Death Squad. A certain Edgar Matobato who claims to be a member of the Davao Death Squad said Thursday, September 15, that there were two instances when Paolo Duterte ordered them to kill someone the vice mayor got in trouble with. Matobato said they killed someone from Deca Homes in Mintal and another one in Toril — all upon the instigation of Vice Mayor Paolo Duterte. The witness also claimed to be one of the close-in bodyguards of Paolo Duterte since his childhood days and he used to accompany the young Duterte when attending his classes at the Ateneo de Davao. 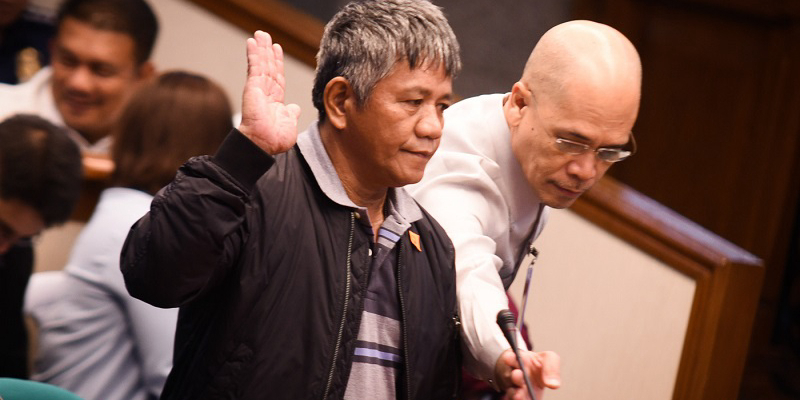 Matobato also claimed to have personally delivered a P3 million payola to the Bureau of Customs officers coming from Paolo Duterte. The witness said that the young Duterte is behind the rice and oil smuggling in Davao City back in 2013. Matobato also accused Paolo Duterte of ordering the death of billionaire businessman Richard King in 2014 over an alleged love triangle. The witness identified Joel Tapalis and Loloy Gabas as the assassins who killed King. Matobato claimed that the two assassins were “double-crossed” and eventually killed by them. He said that he was later framed up too and was accused and tortured by police authorities to admit to killing King. He said he was also forced to implicate police officer Leonardo Felonia to the King murder. Felonia is now facing murder charge in relation to King’s death along with confessed assassin Paul Labang and his cohorts Rodel dela Cerna and Rommel dela Cerna. In a released statement, Paolo Duterte calls Matobato a madman as he denied all of the allegations made by the witness. “What (Senator Leila) de Lima and this certain Matobato says in public are bare allegations and in the absence of proof are mere hearsay. I will not dignify with an answer the accusations of a madman,” Duterte said. It was learned that Paolo also attended elementary and high school at the Philippine Women’s College and not Ateneo de Davao as claimed by Matobato. The young Duterte also denied knowing Matobato or having him as a close-in bodyguard during his childhood days.